Made of rugged 3/16" aluminum. Feature tig welded engine guards. Haven’t used it long, but I haven’t noticed any discernible noise. This went on easily, I like the countersunk screw fittings and the fitted clamps. During installation I whacked it once with a plastic hammer and it moved where I needed it to. Excellent coverage. I haven’t used it enough to rate durability any higher. Very sturdy and well built! Looks great, and fit great too! I would def recommend this skid plate. The easiest piece of equipment I’ve ever had to install. Looks great works flawlessly and highly recommend. I am happy with it. Protects very well. Strong and very good quality. I installed it and rode less than 10 miles before removing it due to noise. I read other reviews that said it echoed engine noise but I was not prepared for how insanely loud it made my bike. I covered the entire thing in silicone and reinstalled and is now perfectly silent. Would buy again. Great quality, quick ship, easy to install. Overall very happy with this purchase. Very good and durable skid-plate. it does bounce some noise towards your head, but I stuffed some foam under it and it made it all better. The oil draining hole is plenty big In my opinion, but also plenty small so nothing is really exposed. Yeah it's extremely well made, durable, fits perfect and looks great. But the sound. Omg the sound. At first I thought I could live with it but pretty soon I couldn't go anywhere without ear plugs. And you know occasionally the ear plugs wiggle out a big while in the middle of a ride. Normally no big deal but with this metal skid plate, it's unbearably loud. You have to pull over and fix your ear plugs.Not just louder engine noise reverberated back to you but also some kind of a high pitch shrill noise. I eventually had to take it off and I'll get a plastic one instead. I would highly recommend this skid plate. It does the job well. Only wish the ears/wings were longer or taller to cover more when the bike drops to the side. This skid plate does it's job. The fit is perfect and it looks great installed. The aluminum is thick and very very durable. I would have preferred it to be coated black, but that's just being picky. Be aware, it transmits sound from the engine and exhaust and makes the bike noticably louder for the rider (All metal skid plates do though). 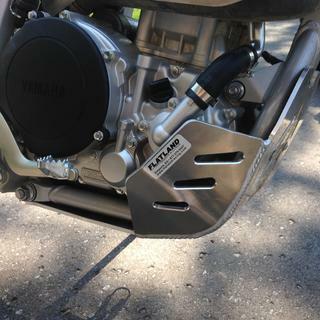 If you want to protect your bike, ditch those useless factory engine guards and get the Flatland Racing skid plate. High quality, durable, perfect fitting... you can't go wrong. 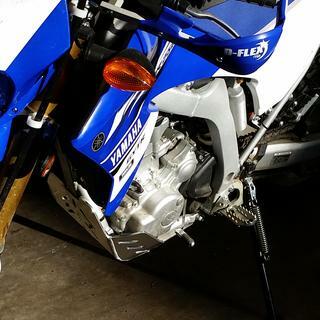 Great skid plate and fit the bike perfectly. Better than the factory plastic plate that comes on it. Gave it as a gift to my dad for his new bike. I really like the design and durability of the skid plate. It was very easy to install with all the pre-drilled holes and fittings matching perfectly. This skid plate should protect the underside of my new bike and I can’t wait to put it to the test. Heavy duty skid plate. 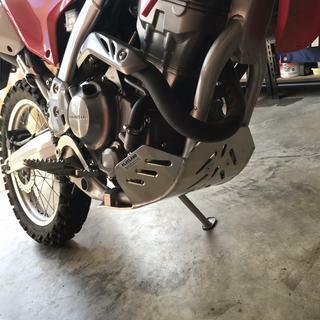 Easy installation on my wr250r. No extra noise or vibration with this plate on my bike. 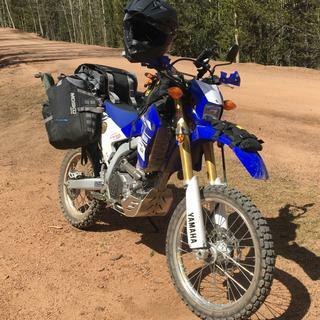 I purchased the Flatland Racing Skid Plate from Rocky Mountain ATV/MC in November 2017 for use with my Yamaha WR250R. Delivery was extremely quick and product was packaged well. 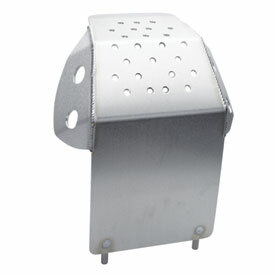 This is a very durable and highly protective skid plate. The welds are clean and uniform, the 3/16” aluminum looks good, the four mounting holes line up perfectly with the stock bolt holes, and there is a cut-out for the oil drain bolt that works well. Installation without skid plate foam is super quick and easy. Along with the skid plate, I ordered the Tusk 2” x 8” x 10” skid plate foam to help absorb noise/vibration and less for mud protection. If I was doing it again, I would opt for the 3/4-inch thick foam. The 2-inch thick foam is too thick and requires quite a bit of trimming to get it to fit well. 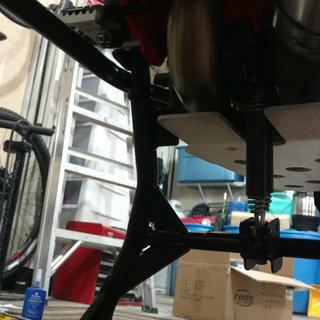 I am satisfied with the Flatland Racing Skid Plate and would recommend it to others. This fit my 2013 WR250R perfectly and was relatively easy to install. I also installed the sound reduction foam. 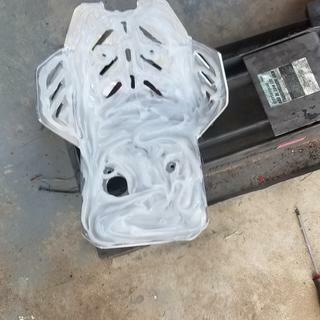 Bolt holes were hard to find with the foam, but wasn't too challenging. Very durable. Great item. Strongly recommend. The product supplied differs slightly from the product image shown. The one supplied looks a lot better. Comes complete with padding (this would have been nice to know at the time of ordering). It took literally seconds to install and is easily removed if required. Awesome skid plate! It fit perfectly and was a snap to install. Finish is excellent as is the protection. It wraps around for addition protection. Ill never buy from another manufacturer. Flatland got it right with this one! Probably the best bolt on for the KTM 690 Enduro. Looks great and makes the bike much more stable when on a stand compared to the flimsy OEM plastic skid plate. 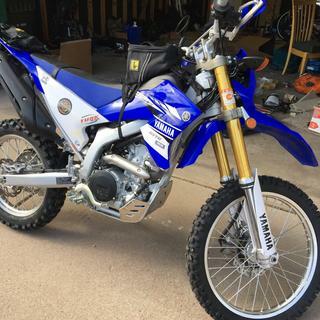 Purchased for a 2016 YZ250X. I originally ordered the plastic Cyclades skid plate. Very thin plastic and minimal protection. Returned it and got the Flatland skid plate. Much beefier. If you ride in rocky terrain skip the Cycra. The Flatland fit was great. I accidentally stripped one of the aluminum mount threads. Emailed Flatland and they sent a replacement out the same day. Great product and excellent customer support. This is a awesome product it fit up perfectly, it looks great on bike and it protects all the vitals under the bike! This is the best skid plate for the money. Easy to install in about 10 minutes. I like that it comes with clean out holes in it already. Looks nice. Protects the entire bottom of motor. I would definitely recommend this skid plate. It eliminates the ugly stock plastic guards. It's a must have before hitting the dirt. 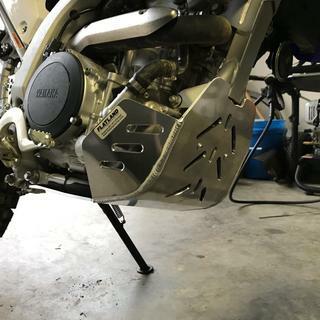 I don't have any other skidplates but the Flatland Racing plate is about the cheapest available for the WR250R and it seems to fit well and offer good protection. 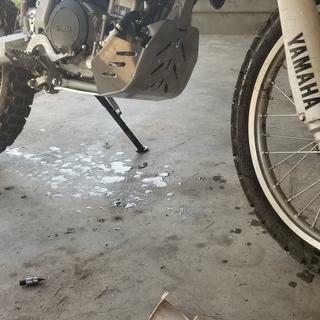 The only mild inconvenience is that on the California WR250R there is a charcoal canister located directly in the way of where this skid plate must go, necessitating either relocation or removal of the charcoal canister. I relocated it slightly above its stock location and rotated it sideways, near the exhaust outlet from the motor, and attached it with zip ties. More professional relocation, or removal is possible. Very good quality, I use some 3/4 peel and stick window foam from a hardware store to reduce the vibration and it worked perfectly. This product is well constructed and an excellent value. The only thing is you need a floor jack to apply upward pressure during installation but no big deal at all. I don't notice any buzzing, vibrations or reflected sound like others I have purchase in the past. 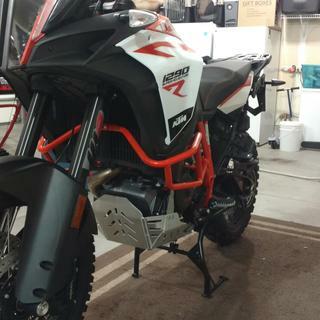 Two of my friends installed one on their KTM 690's and the like this product also. I highly recommend this product. Couldn't be happier with the expedient service. The skidplate fits perfect. The finish is great. Got anfew compliments on the plate so far. It was exactly how I wanted it to be. Easy install, well made. Highly recommend. Incredibly easy install on WR250R. Like the title, it works as well or better than it looks. Great well made product. Very easy and quick to install, engine noise is amplified, so be aware. Foam/rubber might mitigate, but I'm used to it now. Nice insurance for those rocky sections of your ride. Great product! easy to install and holds up great on the trails. I would highly recommend this product to anyone. Perfect fit and looks excellent. Very well built. Simple to install with four screws. Engine noise was expected but was solved by lining it with a self adhesive sound dampening material by 3M. 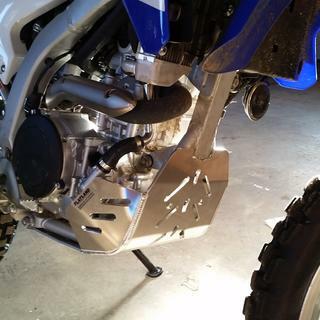 I installed this skid plate for a new 2017 WR250R. It went on easy. I used a thin rubber weather seal between the plate and the frame to lessen vibration. It must be working. I could not hear any difference. My first ride was on a dirt road with this bike. I didn't go 300 yards before I heard the first stone hit. I lost count how many times I heard stones and gravel bounce off the skid plate in the first mile. I am so glad I added a skid plate before I hit the dirt. My skid plate had slots drilled into it instead of round holes. It seemed to allow a lot of dirt pass through to the motor. The slots did make it easy to wash out the dirt. I think I would have preferred the small round holes in hopes of accumulating less dirt. No brainer skid plate choice. Great fit, 1 minute install. Its thicker then i expected (TWSS). I feel comfortable with the amount of protection it provides. Looks good. I haven't noticed any vibration noise of the plate rattling against the frame as others have stated in forums and reviews. The additional noise i hear is just engine noise redirected up which shouldn't need explained. Foam should reduce this. Shipping was quick. Packaging subpar but unrelated to the product. Great protection easy install. If some sort of sound dampening was included it would be a 5. Covers all the important bits, very nice looking high quality alloy, welds are perfect. Works as described, no surprises. I do not fear scrubbing across trees and / or rocks. I did line the inside edges with about 1/8 inch rubber and gorilla tape which almost completes eliminates the noise. 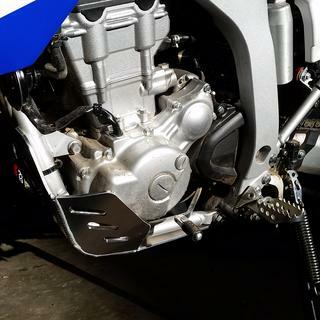 Probably the sturdiest and best value for a skid plate on the WR250R. The only issue was some really high pitch resonance after I installed it. I actually took it off and put a strip of foam tape between it and the where it contacts the frame. That fixed the noise. Bought this for my WR. Installation was a breeze. It's taken a few hits and works as expected. The only reason I gave the fitment 4/5 is because there is a slight rattle every now and then, that only happens when this is mounted to my bike. Other than that, it's great! Product as described. However the motor sound echoing off the plate is terrible. They should include a rubber mat with adhesive that will dampen the noise. Overall it's still a good product. This fits nicely but needs to have the charcoal canister relocated or removed to fit. Not sure if all models are this way, this was a California model Yamaha the plate went on. I also used some bicycle inner tube to insulate the plate from the frame which greatly reduces the induced noise. Split the inner tube, contact cement to the frame where it has contact and it's a wonderful thing. An absolute must. 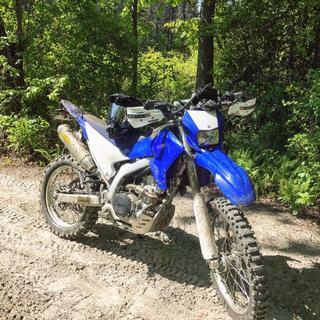 Usually my first purchase when farkling my dual sports. Highly recommend this bash plate. Best skid plate design I've ever had. Bought this for my 09 kx250f. When I received it, I was as giddy as a school boy on prom night! Offers great protection. The side wings are great! Very light weight. The welds for the front mounting ears are off. Angled too far forward. Miss-aligned by half a hole. Not a big deal. just opened up the holes bigger. The front bolts are also too short. Only threaded in three turns. Put in longer bolts. Had a hole for draining oil. That's a huge plus! I give 4 1/2 starts. Only because of the hole alignment issue. If not fit that, I would give a perfect five! I absolutely love this product, it takes 2 minutes to install, is built like a tank and protects extremely well. I just wish Flatlands would include some vibration dampening with it. I was able to devise my own quite easily, but for the money I would think throwing a couple rubber washers, or something similar in would be possible. I would have given it a perfect 5 stars if that was remediated by the manufacturer. Regardless, great product and I highly recommend it! I was looking for a replacement hardware kit for this skid plate as half my hardware is damaged or missing. Is a full hardware kit available? Skid plate itself is bomber. Go to your local hardware store that sells a variety of fasteners. It will probably save you quite a few $$$ over going to the manufacturer. I'd recommend going to the local hardware store for it, or contacting Flatland directly. I'll bet they make it right. Would this be the 2016 updated flatland skid? 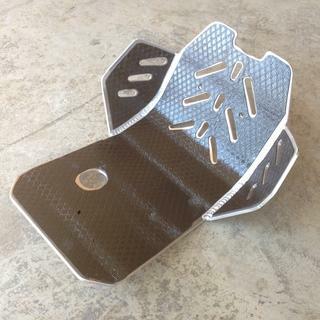 BEST ANSWER: I ordered one of these skid plates late last spring (2016) for my WR250R and it was the new style, with slots not the drilled holes. Super happy with it, way better then I was expecting. I will say it was a bit loud though. I ended up going to the hardware store and grabbing 3/4 inch foam insulation tape, the kind with sticky tape on one side. Couple pieces between the plate and the frame made it 100% better. 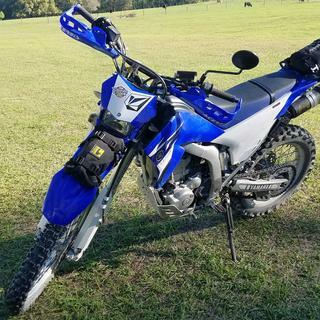 I purchased mine in spring 2016 for a WR250R and it does not look like that. I did get an updated version with more holes than the previous plate. My plate's holes are diagonal on front and only one access plug under. For best reply, consult directly with Flatland. They answer their phones and are a pleasure to deal with! That does not look like the i have. Mkme has slots on the sides not holes. But it is a great skidplate. I don't know if it was an updated version, I have it on my 2016 KTM XCF-W 350 and works well. I don't know what you mean by "updated" but yes this fit my 16' just fine. Plate has slots not holes. this item is compatible with a ktm 2014 freeride 350?? Do you offer this in the black as well? BEST ANSWER: Unfortunately, we do not carry this in black. Is the updated version with the slots available for the 690 (Flatland code 24-46) & if so is this item able to be shipped to Australia? BEST ANSWER: Yes, the skid plate for your machine, it will have longer slots, not holes. And yes, we can ship to Australia.